Shop Simply Dresses for party dresses, prom dresses, cocktail dresses, formal and semi formal dresses, evening dresses and gowns and casual and career dresses for any occasion. Simply Dresses has a vast selection of dresses for all your special occasions, prom, wedding guest, homecoming, bridesmaid, cocktail party, holiday party, sweet sixteen, casual and day to evening dresses for a special night out. 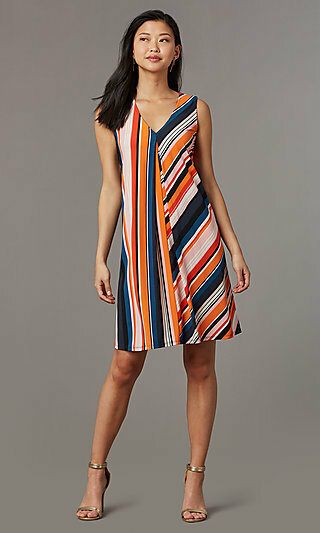 With our large selection of dresses online, you're sure to find just what you are looking for. Where Can I Find Designer Evening Gowns and Dresses? Simply Dresses has a fabulous selection of designer evening gowns and dresses by the most popular designers such as Faviana, La Femme, Tiffany, Sherri Hill, Tony Bowls and many other designers whose dresses you've seen in magazines and on the red carpet. Many celebrity inspired dresses that will make you a star at your prom or special occasion. On a budget? Looking for a cheap evening dress, prom dress or inexpensive cocktail dress or party dress that looks great. You will find it here at Simply Dresses. We also have an extensive selection of casual, career and day to evening dresses in trendy and classic styles in every possible color. We have little black dresses and print dresses, ball gowns and evening dresses. You're sure to find your perfect dress at Simply Dresses.